What do washing machines in hospitals have in common with agriculture? At first glance, not much. But for DEMA, one thing led to another. Jeff Smith, VP of Sales for Strategic Markets at DEMA, explains that in wash systems for hospitals, a system is needed to precisely measure and track the amounts of detergent. Having developed such a system at DEMA, they started thinking about other applications. "We applied this technology to plant nutrient mixes." The Trident system can automatically mix up to 9 different nutrients on preset recipes from a remote phone app. "This eliminates labor cost and creates the opportunity to recreate high yields consistently", Jeff explains. "The Trident is automated, quantifiable and repeatable." 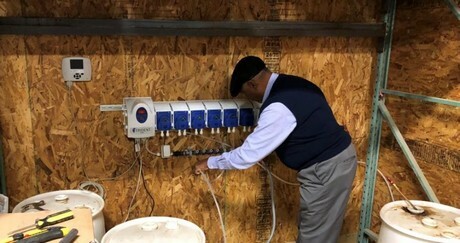 At a recent installation of the Trident AG Nutrient Blending system, DEMA took a farm that was hand mixing their liquid fertility and put them into an automated system. With hand mixing, the amount of product can vary based on stroke length, attention to detail on product amounts, and how much water might be added with the products being mixed. Not to mention the amount of time that it takes to mix all the products by hand and put them into the proper containers. 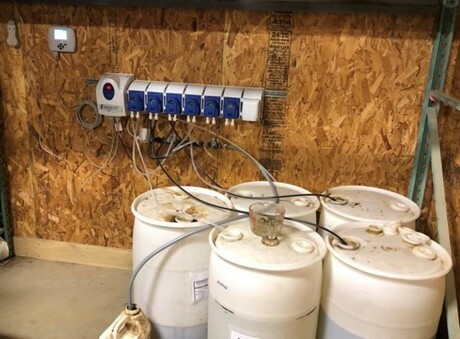 At this particular site, the company was mixing 5 different products for their liquid fertility needs that get added into their potting soil they use on all their plants. This farm happens to be a USDA certified organic farm so their liquid fertility has to meet rigorous standards to be able to be used on the farm. On average to mix 2.5 gallons of their liquid fertility they were spending about 10 minutes of labor to get the mix they wanted. On busy days, they are making 15-20 batches of their liquid fertility. The Trident Batch Blending system began to go up on the wall to take care of the hand mixing of their liquid fertility needs. The Trident Nutrient Blending system is capable of adding up to 9 different nutrients with water into a batch mixing tank that can be up to 5000 gallons in size. The unit can also handle the addition of up to 100 custom blends of nutrients for varying batch size containers, different mixes based on the needs of the plants, and nutrient blends based on the plant stage (flowering, seeding, budding). 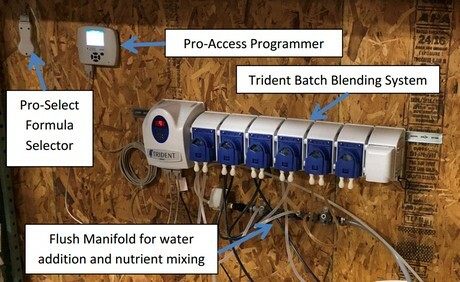 The Trident Nutrient Blending system is capable of data management and can give reports to the user based on usage of chemicals including cost per nutrient blend formula. With the din rail system included with the unit, mounting to the wall is easily accomplished in minutes. The only wiring that needs to be done is the included power cord from the bottom of the unit to a wall outlet. The included Pro-Access programmer and Pro-Select formula selector need to be attached to the pump driver with the included cables. Once everything is on the wall, the tubing can be cut for the pumps. A short piece of tubing is typically used from the pump outlet to the flush manifold. A longer piece of tubing is used from the inlet of the pump to the nutrient container. Once all the tubing is cut and all the nutrients have a pick up tube in them, to get the system ready the pumps need to be primed. The pumps can be primed from the front of the unit. Once each pump is primed with product to the flush, a simple calibration can be done on the unit from the Pro-Access. Once the pumps are calibrated, the formula can be written with the proper amounts of each product that need to be pumped for the batch tank size. Water is added through a timed orifice size in the valve to top off the blend. If nutrients do not like to be in the presence of other nutrients without water, each nutrient can be added individually with water before any other nutrients are pumped. "At the farm, once we had the program written, we tested the amounts, adjusted our calibrations slightly, and run the formula one more time to test the amount", Jeff says. "We saved the farmer over 7 minutes of time per batch (as his labor only needs to press a button and walk away). The simple addition of this set up will save the farmer time allowing him to do other activities, money through labor savings, and allow them to be more accurate and precise wasting less material in the process."